Chana Mona is a Breton priest and Primate of the Great Chapel of Mara in Bravil, as she says in her introduction: "I am Mara's Primate, Chana Mona. I take care of the Chapel's affairs in Bravil Parish, and speak for Mara in the Council of the Nine." 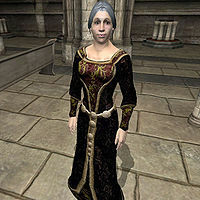 When she is asked about Bravil, she will tell you that she actually has little to do in the Chapel, leaving her plenty time to spare in other duties: "Uravasa and Marz leave me little to do here in Bravil. That leaves me free to devote my time to Mara's ministry throughout the Empire." For the moment, she wakes up every day at 6am and will spend most of the day wandering either around the chapel's benches (33% chance) or in the Chapel Undercroft (50% chance), switching the location constantly. At 10am and 6pm, she will head to the Altar of the Nine for a brief moment of silently pray before heading back to her usual stroll around the Chapel . After a long day of prayer, at 8pm she makes for the Chapel Hall to eat a two-hour dinner. After two more hours of wandering she finally heads to bed at midnight. She wears upper-class attire consisting of a black & burgundy outfit and a pair of gold trimmed shoes. She also carries the chapel key and about 10 gold coins. In combat, she relies on a set of leveled Alteration, Destruction, Mysticism and Restoration spells, along with another leveled Restoration spell. If you install the Knights of the Nine official plug-in, Chana is killed when Aurorans attack the chapel once Nature's Fury is completed. She is apparently shot down the stairs of the chapel with a Dremora field arrow. Esta página foi modificada pela última vez à(s) 05h21min de 20 de outubro de 2015.